Karate Do is literally the way of the empty hand. The origins and the trainingstyle are explained here. Karate Do has its origins in Okinawa and not China as it is often displayed in the media. Karate Do was known simply as Te (hand) on Okinawa long before the chinese influence on Te took pace and developed Okinawa Te. Karate Do was used primarily by peasants and working class people to defend themselves against marauding samurais and plunderers. The possession of weapons was prohibited and carrying weapons was sentenced with death. The the nobility and army were the only ones allowed to carry weapon because of the threat of peasant revolts and uprisings. So common people learned the way of the empty hand in secret and this art was kept secret untill the 20th century when Karate Do opened itself to the world. Gichin Funakoshi was born in Okinawa in the year 1868 and was trained in Shuri Te style by Yasutsune Azato and in Naha Te style by Ysutsune Itosu. He developed the Shotokan style out of the other two Karate Do styles, which is nowadays the most prominent Karate Do style in the world. The word Shotokan consists of Shoto, “rushing of the needles in the pine wood“ which also was Funakoshis pen name, and kan, “house“ and although he never used the name himself and just called his style Karate Do. His students invented the name Shotokan to honor their master Gichin Funakoshi. He is the man who introduced Karate Do to Japan and demonstrated his combat art to the emperor and the royal family after which he decided to stay in Japan and to spread the knowledge of Karate Do. Master Gichin Funakoshi died at the age of 88 in the year 1957 and you can read his story and the origin of Shotokan Karate in his autobiography “Karate Do: My Way of Life“ it was a very good book which I really enjoyed to read. Karate Do training consist of three different training phases aside from warming up warming down. Kihon means basic training where students train the basic techniques and movements of the way of the empty hand countless times to perfection. The basic blocks, kicks and punches are trained here without a training partner to be able to concentrate on oneself without the distraction of facing an opponent. Kumite means partner training and forms he second part of Karate Do training. It is separated into different difficulty levels dependent on the skill of the Karateka, “Karate scholar“, and goes from ritualized Kihon Kumite, where every movement and action is performed step by step and ritualized, to Randori which is open sparring against each other. 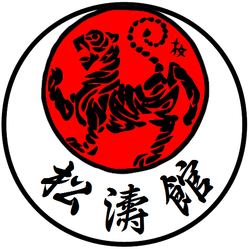 Another form is Hapo Kumite where a single Karateka stand in the middle of a circle and has to defend against several opponents from all sides which can freely attack. Kata is called the kind discipline of Karate and was the only form tot rain at the beginning of the combat art as it was not allowed to train any form of combat art for peasants and common people. They used Kata as a disguise to train Karate without the fear of punishment as Kata looks like a ritualized dance for someone who does not know Karate Do. So basically Kata is series of combined ritualized techniques where the Karateka fights against several opponents. Here I included a Youtube stream of the first Kata called Heian Shodan. I am walking the Karate Do now for six years and I still do not have the feeling of doing the first Kata right as there is always something to improve. On the one hand no one can possibly learn Karate in a couple of weeks but on the other the training methods of Mr. Miyagi make sense and his sayings in the Movie bear some truth in them. The first rule of Karate Do is „ Karate Do ni ente nashi“, Karate does not know a first attack, and because of this every Kata starts with a block. Another rule is „Karate-Do wa rei ni hajimari, rei ni owaru koto wo wasuruna“, never forget that Karate starts and ends with respect, which is also taught to Daniel by Mr. Miyagi. Do not think about winning only think about not losing, „Katsu kangae wa motsu na makenu kangae wa hitsuyo“ ist what Mr. Miyagi tells Daniel when he is about to lose the final fight. Gichin Funakoshi taught his students 20 rules of how to train and live Karate Do and many are quoted in the Karate Kid Movies. Concerning Mr. Miyagis trainings is to say that they are very clever as he included Karate Do in Davids everyday life by letting him do work around his house and Daniel did not recognise the Karate behind it at first but only later on. Everyone can train Karate by washing his windows or polishing his car because you only need to focus your mind on what you do and why you do it. Every Karateka needs a special training uniform called Karategi or Gi which somehow looks like a white bathrobe. The whole training uniform consists a of the „Ugawi“, suit, the „Zubon“, trouser, and the „Obi“, belt. The colour of the belt designated the skill level of the Karateka and ranges from white, the entrance level to yellow, orange, green, two times blue, three times brown to black belt the master level. Next to the uniform the Karateka should buy a pair of Karate gloves for Kumite training. I would also recommend to buy a book about Karate Kata and a book about Kihon, Kumite and Kata to read look up things which were not understand during the training or afterwards came to mind. Super Middleweight 8.5 oz Traditional Karate Uniform. Available in sizes 000 - 12. Largest sizes around. Colors are Red, Black, Blue and White. Ichi, ni, san, chi come on train Karate! The Karate Rap a blast from the past. Very interesting and informative! The karate rap is... well... something else! Daniel Mendoza, or Mendoza the Jew as he proudly billed himself, was a professional Jewish boxer from the East End of London who developed the art of scientific boxing.